We will make the most of Google’s, Yahoo, Bing and other Local Map Placement and search results for every business location or franchisee. Our SEO Management Team will create a profile for a killer listing in Local Maps for every Agent, Associate, Franchisee or Location. Why? 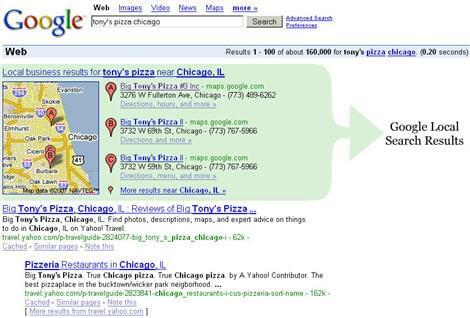 As the screenshot below illustrates, Google Local can and often will dominate what’s seen above the fold? It is an absolute must for 99% of the local Agents, Locations, Franchisees and Associates who expect business from local search results. Although search volumes are typically low as compared to national terms, local keyword phrases convert higher. 2. Evaluation and recommended Keyword phrases.